TRANSPARENT PROTECTION: The transparent case preserves the original look of your Apple iPad Mini 4. The crystal case made of resistant plastic protects against scratches and wear and tear. GREAT HANDLING: The material is resistant and dirt-repellent. iPad Pro 9.7 Clear TPU Case ,In USA Stock Shipping. Poetic Lumos Flexible Soft Transparent Ultra-Thin Impact Resistant TPU Case for Apple iPad Pro 10.5 Crystal Clear. The Clarity case is designed for the person on the go. Its a simple protective case that is made up of a thin TPU case that forms the perfect blend of style and protection. IPad 9.7 Case, Poetic Lumos X Flexible Soft Transparent Ultra-Thin TPU Slim-Fit Trifold Stand Folio Smart Cover [Auto Wake/Sleep][Pencil Holder] for New Apple iPad 9.7 (6th Gen 2018). SLIM PROFILE - Clear TPU back case with a slim profile and form-fitting mold. High-quality material This iPad Mini 5 TPU Case is made with High-quality transparent soft TPU material. Ultra-thin, light-weight, and impact resistant. Easy installation and removal Access all buttons conviently. This DEOS Gorgeous Tech Clutch Case in genuine leather and features white crystal heart. Fits Apple iPad Mini and other small tablet devices. Apple iPad Mini & other small tablet devices. Dog Collar Batteries. Ultra-thinTransparent Crystal Clear Silicone Soft TPU Slim Case Shockproof Protective Cover with Pencil Holder for Apple iPhone Pro 11" 2018. Compatible for Apple iPad Pro 11" 2018 Release ONLY. Ultra-thin, lightweight, compact, snug around your iPad well and perfect fit, add no bulk when the case on. Scratch-Free Shock-Absorbing Super Strong Polycarbonate for Extra Protection. Unique, Slim Design with Style and The Utmost Protection. Precisely Cut Openings To Allow Full Access To All The Functions Of Your Device. Model Number We will look it for you. This item is Japan import. The crystal case is a hard, plastic shell, which fits over the outside of your iPad Pro™ to protect it from the nicks, scratches, and abrasions that can occur with normal daily use. Frosted Polycarbonate Case for iPad Pro™. Look at pictures, these are very high quality cases. MINIMALISM AT ITS BEST - Engineered to emphasize thinness without compromising iPad security. Transparent back cover enhances its ultimate simplicity. ULTRA-CLEAR - Transparent body reveals and enhances the newly designed glass backing of your Smar ipad, the perfect protection accessory for your ipad. COMPATIBILITY: Made to fit Apple iPad Mini 4. 1x Case for Apple iPad Mini 4. For Apple iPad Mini 4. ANTI SLIP: Soft and flexible material provides ultimate non-slip grip while feeling smooth to the touch. Fits iPad 2 3 4. All products are handmade in our store. We do not sell diamond sticker case. 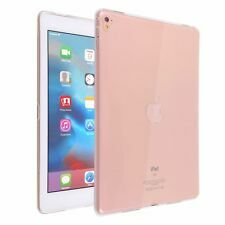 * Specially designed for Apple iPad Mini 1 2 3 4 100% Brand new soft TPU Protect your iPad from dust, shock and scratches Lightweight and Slim design preserve the original look of the device Full accesses to all controls, buttons and ports Fashion design, easy to put on and easy to take off. COMPATIBILITY: Made to fit Apple iPad Air 2. 1x Case for Apple iPad Air 2. For Apple iPad Air 2. ANTI SLIP: Soft and flexible material provides ultimate non-slip grip while feeling smooth to the touch.